In my State of the Order address, I discussed many topics. But I didn't discuss the effect of local resistance against the New Order. That's because, well, there wasn't any. The New Order rolled in, and the miners didn't lift a finger against us. Rebel miners aren't especially good at doing things. Luckily for us, they are good at talking about doing things. They engaged in many tear-fueled discussions about how to defeat us. 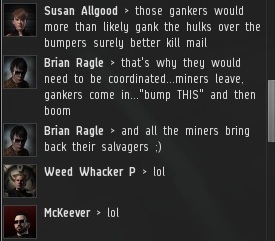 Once ice miner boasted that the miners would band together and hire gankers. 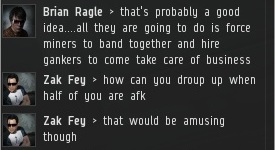 Agent Zak Fey pointed out a big weakness of AFK miners: They're AFK. 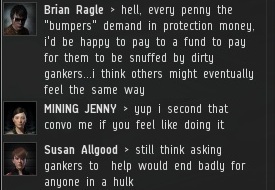 Other miners were anxious about inviting gankers into the system, because the gankers might turn against the miners. Brian Ragle was confident a coordinated effort by miners could pull it off. Brian suggested the miners pool their isk to fund the effort. Needless to say, this never happened. Isk-hoarding miners tend not to be the most generous people. The upcoming EVE expansion will change the bounty system, though I suspect these miners don't know how it will affect the game. 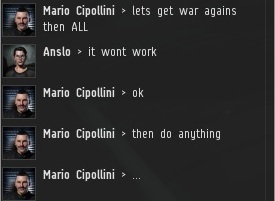 Meanwhile, Dipak P played the "powerful friend in nullsec" card, but that never went anywhere, either. ...Then there was the wardec option. 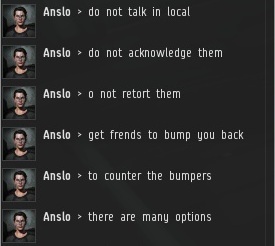 That conversation was brusquely interrupted by pro-carebear forum warrior and self-styled resistance leader Anslo, who advised against wardecs. This irritated the miners, who wanted to at least engage in fantasies about wardecs, if not actually pay for them. Anslo's laundry list of actions that the miners needed to take was met with silence. I can just imagine what the miners were thinking. They only wanted to be AFK, and Anslo was handing out homework assignments like a cruel teacher on a Friday afternoon. The next day, the rebels of Tolle reconvened to talk strategy. After making sure there were no New Order spies about, they began venting their frustrations. J Makbema was upset about his fellow miners' inaction. However, the Goons' Gallente Ice Interdiction remained a complicating factor. 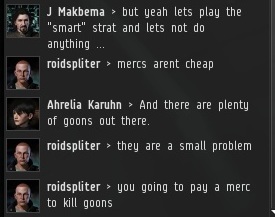 What if the Goons attacked the mercs? roidspliter got tagged with the "defeatist" label. 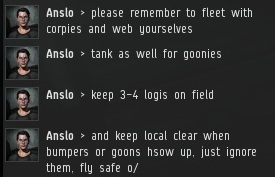 Highsec miners are such creatures of habit. They would rather dock up than move to another system to mine! 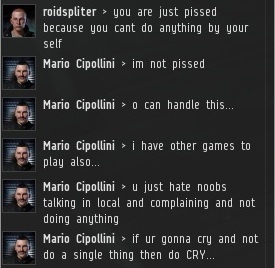 roidspliter became his own "powerful friend in nullsec". If the preferred strategy is docking up, it's no wonder the Goons are so successful in their wars. You can only lose so many battles against the New Order before the infighting and recriminations start. Poor Mario gnashed his teeth at the laziness of the resistance. This is a classic collective action problem: The collective agrees action is necessary, but individually they would rather someone else do the work, so no action is taken. Toss AFK'ing and bot-aspiration into the mix and you can guess the result. The silver lining? If miners are powerless, they also can't hurt each other when they get into a fight. This is my problem with the whole "I won't pay because of the principle" line so many miners take. It's plainly obvious that miners have no principles. With enemies like these, is it any wonder the New Order marches from victory to victory? If you're reading this and you're considering rebellion, save yourself the frustration. The more time you spend with rebels, the more you will grow to dislike them. If you really want to help, join the New Order and encourage your fellow miners to do likewise! Hey now, what did we say about content over advertising? Hey, they have "multiple individuals tending to it" but "do not simply wish to publish content for the sake of publishing content." Perhaps we see more content once they have something to say. I like how I'm estimated to have 70m skillpoints on the "bumper tracker". 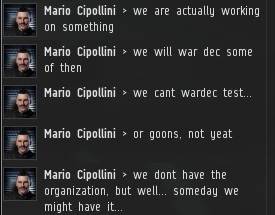 Why would you even want to pay to wardec goons, it's like half a billion a week. Oh no! Half a billion! 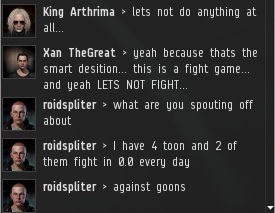 Tell us all about how half a billion is a lot of isk. 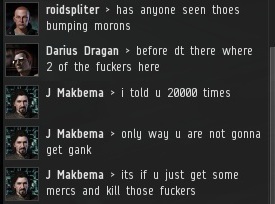 Mines ice all day to support PvP main, complains that 500mil is a lot of isk. This is where the argument is debunked. Dammit, I have to go the way of the bot and register my account, I keep getting impersonated =(. I found it very funny how the whole list of things to counter us bumpers requires time, or effort in excess of the 10mil required for a mining permit. Not to mention all the "let's get others to do our work" mentality. One thing some people seem to forget, is that wrong or not, what New order does is make miners life more interesting. It's doesn't matter if you with them or against the New order. Why can't you adapt and enjoy the experience, what does it matter if it isn't EXACTLY the way you tough it would be. Routine is poison to the mind people, live a little and make the most of it. The more I read what the miners post here or in-game, the more I see what the Order is attempting to do. I came here at first to see if I can lend some defense to the miners in hi-sec. Now every time I'm near a miner, I feel like putting on a T-shirt with the text "I'm with stupid --->." Resist the New order if you must, but enjoy it while doing it and forget all the empty threats and pointless petitioning. Regarding miners, bumpers, etc... yesterday I was very busy making some recon in low sec space to establish some logistic routes, trade systems, etc, to set up a corp that sells T2 modules and ships in Gallente-Caldari space. My intention was to include low sec for higher revenue business, with an eye to going to some selected null sec systems in this zone in the near future to sell some specific items... doing some routing carelessly I got ganked and PODed by a camping party in one gate... thats life, men. Local has activity in that systems, even with only 2 or 3 capsuleers there. In one gate there was a kind of tournament where they (about 10 capsuleers) was beating each other asses with enthusiasm, which was no obstacle for them to try to lock and shoot me when I was passing. There was things happening there, certainly small (no big fleet engagements, nor an epic scams, nor 100Bisk business), but interesting; myself had a fruitful conversation with the dude who destroyed my Iteron Mark V (about 600Misk loses) the day before, which permitted me to gain very valuable local info about the 'incident' system and to test about a possible deal with his Corp to clear pass for my logistic vessels in 'their system'. After being killed only three systems away, I take my clone in a near High Sec system... local, with more than 40 men strong, was dead for the 20 more minutes I remained online... 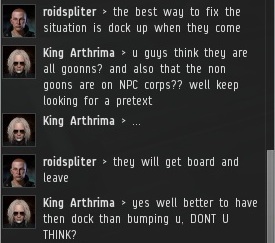 If bumping is the air of life in High Sec, hail the New Order! I think I'll put one of my toons in the bumping business... when James 315 return to Halaima and Kamio, there will be a big void and a lot of opportunities in Gallente space... yep, I'll be putting a department in my new Corp for 'Bumping Services'; I think will be an interesting revenue source to explote. I hope your pvp toon is a bit better. Man... wars are lost and won not only by the weapon guys, behind them there is a lot of people allowing them to fight.... most of the time taking risks as high as the fighters themselves... look to the Coalition casualties in Irak and Afghanistan between Logistic and Support forces. So, I'm a peace woman, with business in mind, no afraid of wandering Low Sec or even Null Sec... knowing that there I'm only a duck to shoot down... but if there is the need, I have what it is needed to burn some billions of ISK to hire the adequate support... do you think that EVE is all about überfighters in shinny big vessels? There is also the guy who takes a covert frigate to expose his balls to put a cyno where it is needed... or the one who expends months in new toons trying to infiltrate an enemy corp. Diplomats that speak more than fight.... scammers that go with intelligence, not battleships. And economic women, as myself, that make plans that expand many months, with very large outcomes expected... I can beat my enemies (or at least try it) without the need to board a combat vessel. Most people don't realize wars are an exercise of logistics, not combat. Don't worry about it Erikkha. Welcome to the Order! 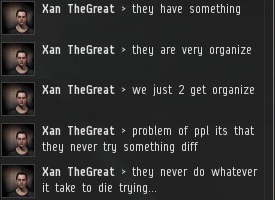 You don't need to wardec us just come out to deklein. Murk, thanks for your wellcome; regarding war Logitics, I had enough of they in RL when I was in the Army. No, people do not realize how complex is to field even a simple infantry battalion, not to talk about more heavy units as tanks, artillery, helicopters, etc... A single advanced Hospital can be a nightmare involving hundreds of men to deploy it, guard it, supply it, transport casualties from front line to the post, and from the post to the second line medical facilities or home, etc. that probably will imply personnel from the Army, the Air Force and even the Navy (is typical to have second line Hospitals in vessels if they are deployed, as the US forces do in most of its wars; is doctrine also in UK, France, Spain, Italy and Greece, and I suppose it will be the same in any other Armed Forces with big navies). In EVE it is the same; reading miners about hiring mercs the way they do is laughably; they know how much will cost to field a merc per day? To cover its ship, for example a Tempest full fitted? Any implants? That winning the war may be dictates to cover big onerous casualties (think about covering 5 Tempests, its fits and pilot implants lost in a single small battle)? Also, the mercs need to see that you have nuts, or probably will think about making a bit more carnage with you in any moment. Yeah, miners are at the lowest step in the EVE scale... but that is its fault, for simplifying so much this incredible complex game. New Permit, New Code, New Life!